Since we last met in the pages of Unwinnable to talk about Shaft, I’ve been doing a little homework. Got myself a copy of the first (of seven) of Ernest Tidyman’s Shaft novels. It’s been a few years since I watched the Shaft movies, but something about my memories of the films doesn’t quite jive with David F. Walker’s version of John Shaft. Walker’s take on Shaft seems more real and grounded. In the movies, there’s a barrier of sorts; we’re watching Shaft act and react, but we don’t know why he’s doing what he does. In Tidyman’s books and in Walkers’ stories, we’re inside Shaft’s head, thinking his thoughts and feeling his emotions. So, since I’ve long been of the mindset that the book is better than the movie (and something telling me that this is where Walker is coming from) I figured the first Shaft book is the place to start. I finished Tidyman’s first Shaft novel just in time for issue #2 of Walker’s Shaft: Imitation of Life, and my suspicions that Walker is following the novels proves to be true. 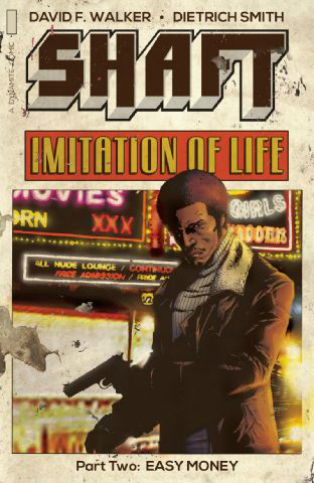 Imitation of Life picks up shortly after the events of the first Shaft book. Issue #2 of Dynamite’s second Shaft series takes us in a different direction than issue #1. Shaft agrees to be a consultant on a film to pick up some easy money. I can’t tell if Shaft has ditched looking for the missing Mike Prosser, if Shaft found out the kid died or if Prosser will wind up tied into the film Shaft is working on. I’m also feeling that four issues won’t be enough to fully flesh out the Imitation of Life story. Dynamite’s first Shaft series, A Complicated Man, had the benefit of six issues. Not that I didn’t completely dig issue #2, I’m just concerned the story will rush to the end. Walker continues to show why he’s the right person to helm a new Shaft series. He’s got Tidyman’s tone down pat but his own style shines through. I can’t wait to read his novel, Shaft’s Revenge (which I also picked up this week but it’ll be a bit before I get to it, sadly.) Dietrich Smith’s drawings are good, but too clean for what the world of Shaft needs. I’d like to see cover artist Matthew Clark and cover colorist Vinicius Andrade team up on art for Shaft at some point. Clark and Andrade bring a certain grittiness to the character of Shaft and the character of New York City that would give the Shaft comics that extra face-rubbed-in-the-dirt they need. I need to be careful lest I get completely lost down this Shaft rabbit hole I found. It seems that five of the six remaining Tidyman Shaft books are difficult to impossible to find (Shaft’s Big Score being the one that turns up most frequently, behind the first book) but word has it that Dynamite has plans on reissuing these. I just have to be careful and not accidentally buy the ill-fated Shaft television series. I am really curious about it, though. I wonder if it does to the Shaft movies what Popeye Doyle did for The French Connection. Even Babe Ruth had bad days. It’s hard to say if the six-issue miniseries Project Superpowers: Blackcross, written by one of my favorite comic book writers, Warren Ellis, is a complete success or failure. I definitely walk away from it not feeling fulfilled. Maybe it’s because I read the trades of Grant Morrison’s Seven Soldiers not too long ago that dealt with a similar premise, and executed that premise better. The premise basically being a horror genre version or re-imagining of established superheroes. That said, Morrison had way more issues to tell his story in a decompressed fashion, where Ellis only had six. There are things to like in this series, but there are also some glaring things that I didn’t like. I had to do a little research on this title. Apparently Alex Ross and Jim Krueger of Justice and Earth X fame took a run at these characters back in 2008, basically taking a bunch of Golden Age superheroes who Dynamite plucked from the public domain and telling new tales about them with more of an Astro City angle. I feel like if I had read that series it would have helped me understand these spectral characters more in Blackcross. At the same time I kind of like the idea of going blind into a story about people going crazy because they are being possessed by C-List superheroes from the 1940’s. What I did like about this book is Ellis’s ability to pull us in initially with scenes that instill atmospheric dread, while asking questions that will only be answered by turning the page. Ellis still can scare the crap out of me, and the opening scenes of a man setting himself on fire and walking into a lake are simultaneously horrifying, intriguing and mysterious, and help introduce us to Blackcross, the spooked town that this is all taking place in. As the first few issues unfold we are introduced to more of the primary cast, who are being haunted by the ghosts of superheroes from another dimension with colorful names like Lady Satan and the Green Lama. Most of the initial people we meet in “our dimension” are pretty unlikable, but the idea that they’re being forced into becoming vessels for these alternate superhero versions of themselves is actually pretty neat, and provides a horrifying take on the old comic book trope of coming back from the dead. Where this all falls apart is in the middle section, where we spend a lot of time looking at panels of people talking to each other, mostly involving the stuff taking place at the police station. Much of this is to provide some background explanation, but it’s hard to tell if artist Colton Worley just didn’t know what to do with these exposition scenes. When he’s allowed to spread his wings and go nuts with the dark Twin Peaks-like atmosphere of the Pacific Northwest town called Blackcross he does great, but when he has to deal with the mundane the book tends to lose momentum. I can’t imagine what this must have been like on an issue to issue basis, because there’s at least two issues where the story disproportionately zigs and zags from the more interesting superhero possession stuff and a supposed serial killer called the American Spirit, to people who are seemingly outsiders trying to make sense of it. At times the visuals tell the story in a sharp and effective way, but other times we get bogged down with exposition and momentum is lost. When it’s revealed that some of these seemingly outside players are in fact key players it feels tacked on, like Ellis needed to justify why he wrote so many scenes with them, and also trying to accommodate all the characters needed to be introduced in this series. There is good stuff in this series, and I feel that further exploration of the supernatural take on these characters could yield better results. I’m not sure if there were problems behind the scenes or what though, but something just seems disjointed about it all. On the one hand I admire that Ellis got his story done in half the issues generally allocated to this kind of supernatural world-building, but on the other I kind of wish he had at least eight issues to tell a better-paced story. We don’t even see all the main characters who are supposed to be on a team together in the same place until the last issue, and by then I don’t know if I even want them in the same place together since they all seem like a bunch of jerks. 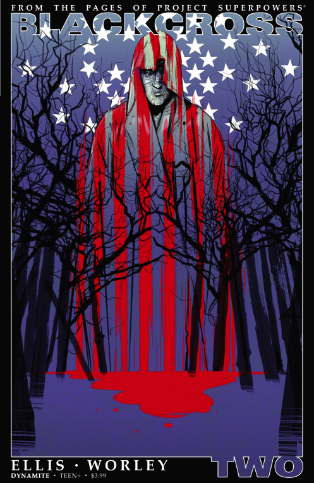 I’ll give a soft recommend of this collection to Warren Ellis fans, and for fans of horror comics. When the writing and art mesh in the right way it’s actually pretty awesome. At the same time though you could also read a number of classic series written by Warren Ellis and see it done better. Or, just read any individual issue of his run on Moon Knight from a few years ago for a good example. Also, if you haven’t read any of his run on Moon Knight and you consider yourself a comic book fan then you should do that immediately. While that was a home run, this is more like a ground ball. Special thanks to Dynamite Entertainment for providing us with an advanced copy of this trade paperback!